Our tire and wheel services started as a very small part of our overall used parts recycling business. As business grew and our inventory expanded, Ron Wilbert saw an opportunity. He successfully transformed a troublesome side of our business, into a very successful business within a business. Today we offer a full range of tire and wheel services. 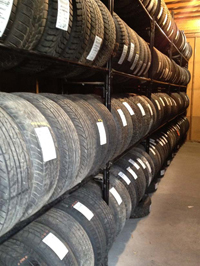 At our Salt Road location you can expect everything the major tire dealers offer and more. Because of our used parts recycling business we constantly acquire a tremendous amount of nearly new inventory. We offer this inventory to you at much less than what you would pay for the same tire at a retail location offering the same “new” tire. We also purchase over 3,500 new, car and light truck tires annually. 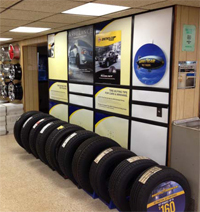 We carry all the major brands; Goodyear, Michelin, Uniroyal, Firestone and many others. We complement these with new and used stock and custom wheels in; steel, aluminum, or alloy. If we don’t stock what you’re looking for our tremendous outreach and buying power can have them here and on your vehicle most times in 24 hours. 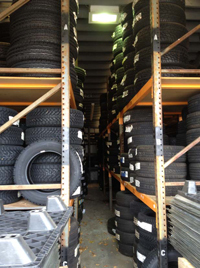 While Salt Road is our premier outlet for new and used tires and wheels, our other two facilities (Lakeside and U-Pull It) stock used tires and wheels. The U-Pull It is our second full service tire shop location that is open 7 days a week. Don’t like your new tires? Bring them back in thirty days for an equal exchange on a different set. Need scrap tires for boat docks, playgrounds, or holding down tarps? We have them free of charge. Under our supervision you load and haul them. There is a minimum of 20 tires per load.